NEW YORK -- Thousands of protesters demonstrated throughout New York City on Wednesday after a grand jury decided not to indict an NYPD officer in the death of a Staten Island man. Eric Garner, 43, died July 17 after police officer Daniel Pantaleo attempted to arrest him for allegedly selling loose, untaxed cigarettes. A cell phone video recorded by a witness showed Pantaleo apparently putting Garner in a chokehold, a violation of NYPD policy. The medical examiner ruled Garner's death a homicide and said the chokehold was a contributing factor. The Justice Department announced Wednesday evening that it will open a criminal civil rights investigation into the case. Moving protests ranged over a wide area of Manhattan, from Union Square to Columbus Circle to the Upper West Side. A crowd of demonstrators blocked the West Side Highway near 51st Street, halting traffic for a short time late in the evening. The entrance to the Lincoln Tunnel was also briefly blocked around 11:30 p.m.
CBS New York reported that at least one person was injured when protesters were penned in with nets and gates at 48th Street. Police told CBS radio station 1010 WINS that about 30 people were arrested throughout Manhattan. A large group of protesters gathered in Times Square, holding signs that read "We want an indictment" and "Black lives matter," while chanting "Hands up, don't shoot" and "I can't breathe" -- a phrase Garner was heard saying several times before his death. 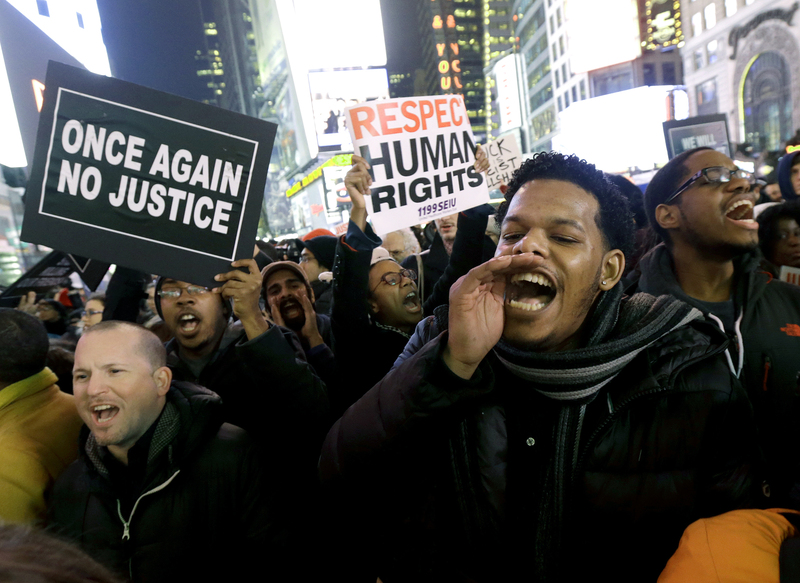 "The lives of black young men, black children, they matter," protester Florence Johnson told WCBS at Times Square. Part of the crowd headed toward the Christmas tree lighting ceremony at Rockefeller Center, although the NYPD kept the demonstrators far from from the actual event. Some of the demonstrators, referencing the tree-lighting ceremony, said, "No justice, no tree," according to WCBS. New Yorker Rashaad Ernesto Green told the station he hoped the country would make drastic changes after what happened to Garner on Staten Island and Michael Brown in Ferguson, Missouri. "It's clear in recent weeks that no matter what happens, people aren't being held accountable," he said. About 30 protesters staged an impromptu "die-in" at Grand Central Terminal as the evening rush began. They organized the demonstration on social media using the hashtag #ThisStopsToday. Protesters stage "die-in" in #NYC's Grand Central Station after news of the grand jury's decision not to indict an #NYPD officer in the chokehold death of Eric Garner. A large police presence was seen in advance of the protest but there were no immediate reports of arrests. Sources told CBS New York that police at Grand Central would be "hands off" any protesters unless they impeded trains or got rowdy. Protesters also took to the streets in the Tompkinsville neighborhood of Staten Island where the Garner incident happened. Several people chanted, "I can't breathe," which Garner was heard saying before he collapsed. Some people at the Staten Island protest told CBS New York they felt Pantaleo got away with murder. "They killed him twice today. That's the second time they killed him. Eric Garner -- I was sitting there when he died," one man said. "I'm not surprised. I'm just in shock," a woman said. "I was hoping that I wouldn't be in shock. I was hoping that it would come out in our favor." "This is a disgrace, a disgrace. The coroner said he contributed to that man's death," another woman said, through tears. "There ain't no justice if we, if you're black. You only get justice if you're white."